Noble, walnut-fruit mix with hazelnut, pecan, brazil nut, walnut, and pistachio flavoured with mango and papaya cubes, physalis, cherry and mango. HAZELNUTnut, ALMOND, BRAZIL NUT, WALNUT, PECAN, cape / gooseberry, sugar, cherry, mango, papaya, melon, pineapple, apple, sunflower oil, banana, pistachio NUTS, vegetable oil, sugar cane, honey, citric acid, melon flavor, sulfur dioxide. May contain traces of GLUTEN, SESAME SEEDS, SULPHITES, SOY, PEANUTS, NUTS, MILK and dairy products. Who is bored of the classic compilation of a commercial trail mixes a little, it is essential to our spectacular HARVARD DELUXE BLEND try. Anything but monotonous, but very beautifully designed colourful and creative, are joining pecans, almonds, Brazil nuts, walnuts, hazelnuts and pistachios added fruity sweet pieces of mango, papaya, melon, pineapple, banana, cranberry, Physalis and cherry. This particular composition of high quality nuts and seeds will multiply together to a taste experience at its best. The cream of the crop of nuts and fruits are here to recognize the unmistakable noble blend in a mix. 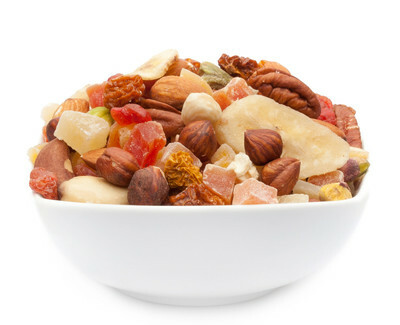 The true connoisseurs and gourmet taste has so much to discover in our HARVARD DELUXE BLEND because these exquisite fruit and nut mixture is not only a feast for the palate, but also for the eyes. A selection of noble nuts like pecans, almonds, Brazil nuts, walnuts, hazelnuts and pistachios combined with sweet fruity pieces of mango, papaya, melon, pineapple, banana, cranberry, Physalis and Cherry provide a nutty-fruity entertainment, the taste buds, the delightfully brings busy and tells their magnificent colours of distant countries. A handful is enough to recharge your energies and to pamper your body and mind on most delectable. Nuts in combination with dried fruit are a classic that we all reinterpreted here in our HARVARD DELUXE BLEND. This particular selection of nuts such as pecans, almonds, Brazil nuts, walnuts, hazelnuts and pistachios provide with its fine flavour of a spicy contrast with the delicious fruit pieces of mango, papaya, melon, pineapple, banana, cranberry, Physalis and cherry. This mixture you can mix or you simply enjoy as a couple of delicious nuts and fruits, if your concentration you just leaving to spice in your Müsli. In any case you will always be seduced anew by its creative assortment and colour gimmick already the sight of this beautiful blend.